Steven Pemberton's XForms demo at XML Prague 2019. Steven Pemberton (CWI) won the Demo Prize at XML Prague for his demonstration ‘A Clock in XForms’. XForms is a web technology and W3C standard, co-designed by Pemberton, originally intended for handling forms on the web. XForms reduces the time needed to design an application by a factor of ten. 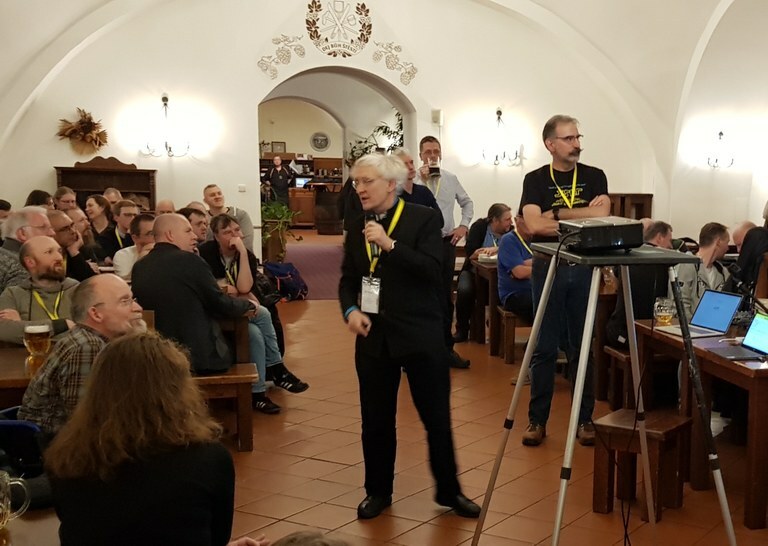 On 8 February Steven Pemberton of CWI’s DIS research group won the Demo Prize at the XML Prague conference for his demonstration ‘A Clock in XForms’. XForms is a web technology and W3C standard, co-designed by Pemberton, originally intended for handling forms on the web. However, since version 1.1 it has been generalised to allow the description of more general applications, and the demo was used to show that. Used worldwide, such as by the Dutch Weather Service KNMI, the Dutch and British governments, the BBC, NHS and US Department of Motor Vehicles, experience has shown that XForms reduces the time needed to design an application by a factor of ten. In his demo, Pemberton showed how to create a clock using XForms, in only a few lines of code.